Most of us like to think that we are fully in control of our horses, but the truth is, often we just manage the world around them so they don’t become difficult to handle. We consciously, or unconsciously, keep him away from situations where they might feel afraid or use gadgets to prevent them from physically running away when they do. But every now and again something happens that is totally unexpected and out of our control, and no gadget on earth will keep our horses from running. You don’t need to desensitize your horse (I like my horse sensitive); you don’t need to spook-bust him (I want life in my horse). You need to show him, through a series of exercises, that if he listens to his rider or handler, he will be safe. The more you practice, the braver you both will become. You can do this by working with your horse over, under, and through obstacles—every horse has a weakness in one of these areas (or all of them! ), and the key is presenting him with many different types of scenarios until you help him rewrite his three-million-year-old risk assessment that says such things are dangerous. Using over, under, through exercises, you and your horse can work together to bring him into this century. 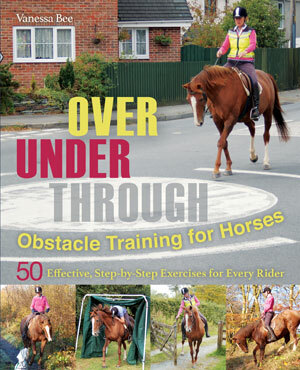 For 50 effective, step-by-step exercises for every rider, check out Over Under, Through: Obstacle Training for Horses by Vanessa Bee.